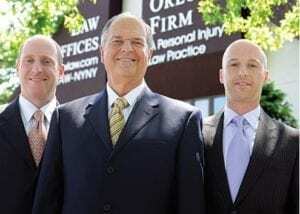 At The Orlow Firm, our Bronx personal injury lawyers have helped clients injured in The Bronx since our firm was founded almost 30 years ago. Were you injured traveling to or within The Bronx? Did police use excessive force when handling or arresting you? Perhaps you were you injured at a Bronx retail establishment or while working at a Bronx construction or industrial site? Whatever grounds your case may fall under, our Bronx personal injury lawyers can help. Have you been injured in The Bronx or in any New York City borough? Contact the Bronx personal injury attorneys of The Orlow Firm at (646) 647-3398. Having handled thousands of personal injury cases, our Bronx personal injury lawyers are highly efficient and skilled in investigating on-the-job, dangerous property and motor vehicle accidents, and all other types of accident and injury claims. Our diligence and experience have resulted in many millions of dollars in compensation for injured Bronx-resident clients. For a no-charge consultation regarding your potential claim, contact one of our four New York City offices.